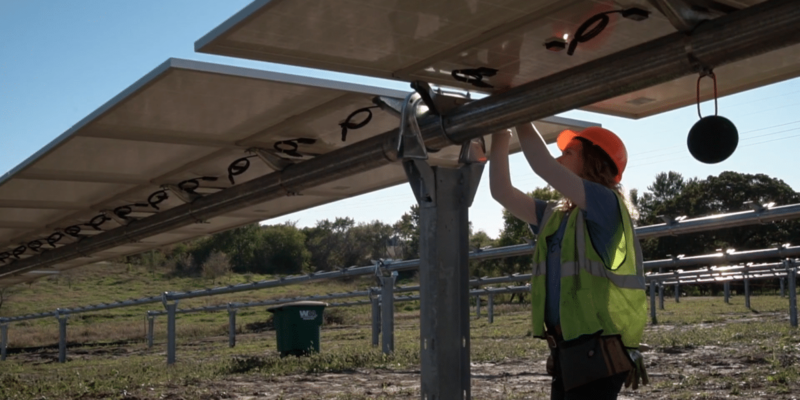 NEXTracker has sued Sunlink for infringing on a patent for a balanced solar tracker clamp, and a separate patent describing the broader support system of a single axis tracker. Image: Ideal Energy - NEXTracker tracking system. NEXTracker has filed a lawsuit (.pdf) for patent infringement against SunLink Corporation, alleging infringement on Patent 9806669 and Patent 9970686. In the lawsuit NEXTracker alleges that Patent 9806669 is shown violated in the series of images below. The lawsuit suggests that the patented part in the top left (Figure 4) is being infringed on “either literally or under the doctrine of equivalents” as shown in the two images to the right and bottom. (i) a rotatable part including, on the one hand, a housing for receiving the horizontal central beam and, on the other hand, a guide rail presenting a circular-arch shape centered on said horizontal axis of rotation, said guide rail extending below said housing and (ii) a base held on the fixed structure and onto which are fastened rolling members, said rolling members being mounted so as to roll in the guide rail of the rotatable part. The second patent, Patent 9970686, looks at how the above hardware – specifically the rotating piece of metal – is attached to the piers in the below image. NEXTracker suggests that the TechTrack system uses five specific components/assemblies that are patented. a clamp assembly comprising a housing coupled to the torque tube such that the torque tube is coupled to the housing, the housing comprising an opening having a major plane normal to a length of the torque tube, the opening comprising a first inner region and a second inner region, the first inner region acts as a first stop for movement of the torque tube when moved in a first radial direction, and the second inner region acts as a second stop for movement of the torque tube when moved in a second radial direction. The suit alleges that SunLink’s TechTrack system has very strong similarities as the system described above. NEXTracker uses the same language, of “either literally or under the doctrine of equivalents” in describing the alleged violations. NEXTracker is a leader in the solar tracker industry; SunLink is a follower.